An account of their lives and mission work in the western desert at Warburton Ranges, Mt. 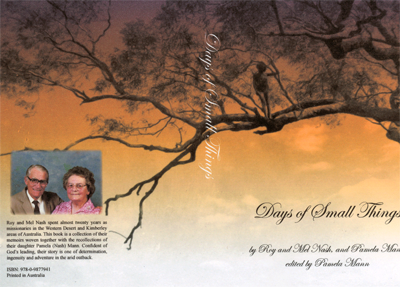 Margaret, and the Kimberley regions of Western Australia, and later church ministry in both the Congregational and Baptist Churches in New South Wales, is told in the book “Days of Small Things”. Compiled from Roy’s anecdotal memoirs, Mel’s journals and personal correspondence, and her own experiences, their eldest daughter Pamela has edited and woven together the story of their family and their mission work over the more than twenty years they served in outback Australia. Roy Nash’s accounts of his involvement in the transport work from Leonora and Laverton, the last bastions of civilization before the 500 kilometre trip through desert sand hills, dried salt lake beds, and mulga scrub to the mission site at Warburton Ranges, are a testament to the courage and adventure of those early missionaries. Personnel and supplies were transported in less than reliable ex-army trucks that ran on charcoal gas and travelled often at only eight miles per hour. The book gives some insight into the upbringing of Roy and Mel, through their college preparation for missionary service where they first met, and to their first appointments as probationers. Arriving at Warburtons as a newly married couple in the early 1940’s, the first task that faced them was to learn the Ngaayatjara language of the indigenous people. There are approximately 200 photographs in the book, some of which have anthropological and historical significance in regard to indigenous Australian people who were formerly known as aboriginals.